"You Don't Get Thick Skin Without Getting Burnt." I’ve been in this funk for the past few weeks. And I haven’t been able to shake out of it. And I think I finally found the problem. I’m terrified to mess up. Whether it is college, extracurricular activities, or work, I am terrified I am going to make a mistake, that I am going to fail. I think I have always been somewhat of a perfectionist, but lately my schedule has been super busy and it is difficult to be perfect all the time, in fact it is impossible. And if I am not perfect, I have a terrible session of making myself feel miserable for it. So, it makes sense that I am scared to mess up, but that doesn’t stop me from messing up. Sometimes I feel like it happens even more when I try to be perfectly perfect, as if I self-sabotaged myself somehow. I think I have gotten so scared to make a mistake that even my relationship with God has begun to feel like a business deal instead of being personal. Why would I want the most perfect being to see me fail. This mindset is stupid and toxic and I will tell you why. God made us to fall every once in a while, but the most important thing is we get back up again. We can’t stay down even when we feel like giving up. 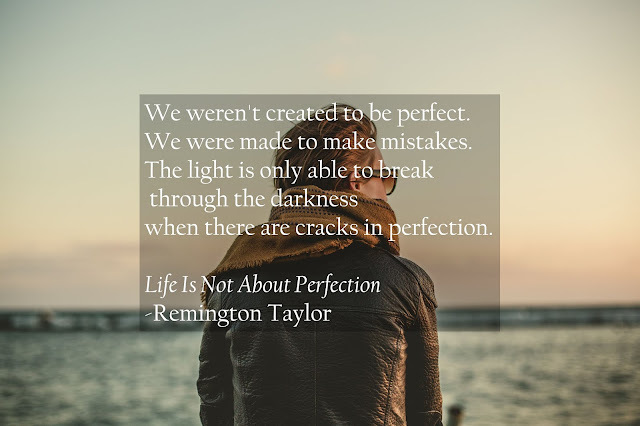 We were not created or expected to be perfect at all times, not even for the most part of our lives. We wouldn’t be human if that was an expectation. We are still learning, and learning involves failure. That doesn’t mean we shouldn’t strive to do better, because we should. But we just shouldn’t strive to be perfect. In fact you should never trust anything too perfect because it more than likely is an illusion. There are lessons to be learned in failure. The truth is, we will all fail. And a little failure is good as long as we get up again and try. We just have to try and work twice as harder than before. I know, it doesn’t sound pleasant, especially after you already feel you were taking a beating. But the truth is this life is not easy. But it is worth it. Maybe right now you don’t understand why everything is happening but in a few years you’re going to look back and find a valuable lesson in the situation you were once in. So, I encourage you to mess up a little. And I will take on this challenge myself. Because even a little mess can be beautiful (that was cheesy, I am ending on that note).